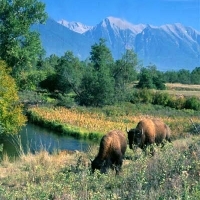 Explore Moise's 18,500-acre National Bison Range. Drive the grounds for an up-close look at 350-500 head of bison, plus elk, deer and antelope. Established in 1908, the National Bison Range is one of the oldest big-game refuges in the U.S., and is also a popular place for bird-watching. While at the National Bison Range, be sure to get out of the car and stretch your legs on one of the designated hikes. Take a stroll on the mile-long Nature Trail or a shorter jaunt on the half-mile Bitterroot Trail. Just be sure to stay on the designated trail.